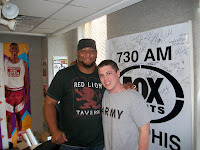 Former Ole Miss Rebel and New Orleans Saint, Deuce McCallister, joined us in studio for about half of the show today and we talked about everything I could think to ask. His college career, coaches, injuries, New Orleans, recruitment, the Super Bowl- anything I could think of. We also took questions from callers. He was absolutely fantastic on the radio, and a great guy. The audio is broken down by segments below.